Having shared a lot about parenting a child with autism in previous writings, I now don’t feel a need to preface this piece with a review of my son’s condition. When you write every now and then about your son with autism, people you meet start talking to you as if they know him. “How’s Gabriel?” they ask. I don’t mind the familiarity. I consider it a bonus for writing for the top broadsheet in the country. 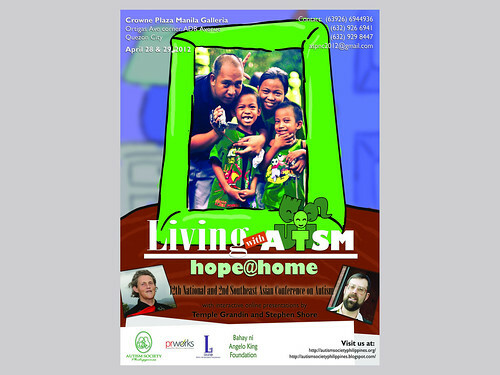 If you are a parent, teacher, therapist, nurse or doctor to a person with autism—no matter what age—try to attend the Autism Society of the Philippines’ (ASP) conference on April 28-29 at the Crowne Plaza Hotel. Temple Grandin, Ph.D., and Stephen Shore have agreed to do an interactive web discussion at the conference. These two professionals are themselves in the autism spectrum, so you will hear firsthand about their challenges and how they have coped with the same. Grandin’s book, “Emergence: Labelled Autistic,” answered a lot of questions I had after my son’s diagnosis. Among the things I remember reading are: She didn’t like being hugged because she could not stand the smell of people (she has a heightened sense of smell, which my son also has); she invented a hugging machine that she used whenever she felt the need for a hug; her ideas have revolutionized the livestock industry. Whatever deficits the autism condition bred in her, Grandin has more than made up for with the intellectual processes that have brought her a Ph.D. and a living as a professor of Animal Science at the Colorado State University. I liked it that when Claire Danes won an acting award for playing the title role in the HBO movie “Temple Grandin,” the real Temple was shown in the audience wearing her signature cowgirl attire. Shore, for his part, had to contend with a nonverbal early childhood and difficulties that prompted a recommendation to his parents to have him institutionalized. To his luck, his parents refused and, as it turned out, he is a professor at Adelphi University. He is also a consultant on issues relating to education, relationships and employment for adults with autism. 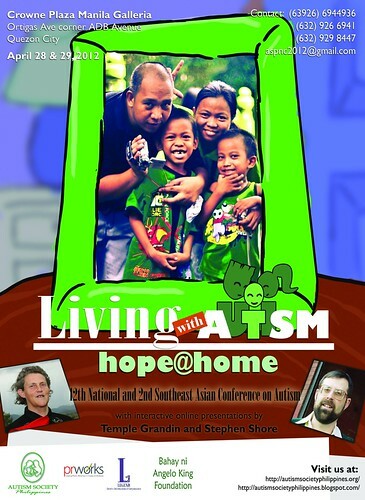 Grandin and Shore are among the reasons I’m attending the ASP conference. I wish all parents of children with disability could go. Whenever I’m at a conference, I can tell the parents of the newly diagnosed children. They sit quietly, eyes glistening from the tears that they try to keep to themselves. I was like them the very first time I attended a conference. I sat there with shards of fear in my heart. I took away a lot from that first conference, so much so that the following year, I brought my husband with me and, in succeeding years, included Gabriel’s therapists. The Internet no doubt can bring up a wealth of information about autism or any other disorder. But there is nothing more exciting and inspiring than being with people who share the same cause as yours—experts who can give updates on trends in treatments and teaching methods; teachers and therapists who are willing to go the distance for our children; parents who need to bounce frustrations off, as well as buoy up, one another. The importance of being earnest in helping your autistic child cannot be overemphasized. But if you go to a conference and come away frustrated because the other kids are doing so much better than yours, you need to lighten up. Go to educate yourself, to meet with kindred spirit, to share best practices, to give and receive hope and, above all, to get passionate all over again about the present and the future of your children. The 12th National Conference and 2nd Southeast Asian Conference on Autism will be held on April 28-29 at Crowne Plaza on Ortigas Avenue. Call 9266941 or 0917-5562075 or e-mail aspnc2012@gmail.com. This article appeared in the print and on-line versions of the Philippine Daily Inquirer.